Blonde Legend Video Slot Review - Casino Answers! Blonde Legend is a 5-reel, 25-line video slot developed by Random Logic, featuring a wild symbol, a free spins feature and a bonus game. You can play the Blonde Legend video slot at Bovada. Bets on the Blonde Legend slot machine are $0.05, $0.10, $0.25, $0.50, $1, $2, $5 and $10 per line. You can select from 1-25 paylines on a spin on Blonde Legend. You can bet anywhere from a nickel up to the maximum total bet of $250. Blonde Legend offers a great betting range that is suitable for casual players and high rollers. 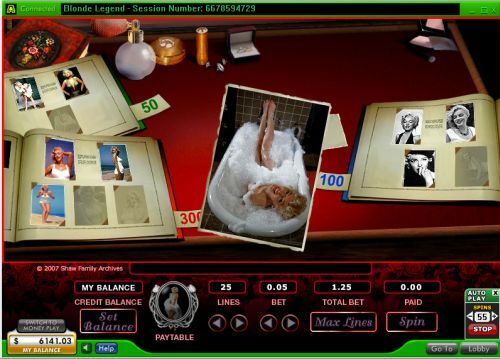 To play the Blonde Legend slot game, select your bet and press the “Spin” button. For those looking to play all 25 lines, press the “Max Lines” button. The highest paying symbol on the Blonde Legend video slot is one of the Marilyn Monroe symbols, which will pay up to the 1500 coin top jackpot. The second highest paying symbol is another Marilyn symbol, which pays up to 1000 coins. 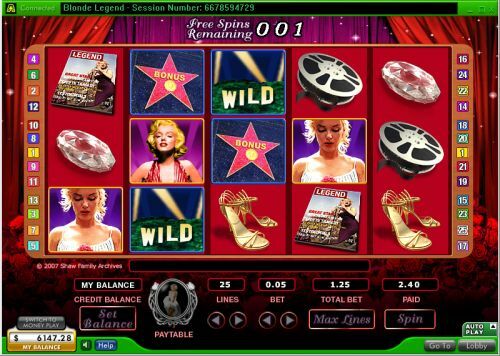 The wild symbol on the Blonde Legend online slot game is the Hollywood symbol. It will substitute for any symbol except for the scatter and bonus symbols. It does not pay any wins by itself. The scatter symbol is the Vegas symbol. 3, 4 or 5 scatter symbols anywhere on the reels will award you with 5, 20 or 25 free spins. Free spins will play the same number of active lines and bet per line as the original game. All prizes, including additional free spins (which can be won infinitely) can be won during the free spins feature. Remember, free spins can win you free cash when you play Blonde Legend at Bovada! All symbols pay left to right on consecutive reels of an active payline, except for the bonus and scatter symbols. All wins are multiplied by the bet per line. Scatter and bonus wins are paid in addition to payline wins. Only the highest win is paid on each of the active paylines. Open up the Blonde Legend autoplay mode by pressing the Up arrow on the “Auto Play” box. You can play up to 99 autoplay spins on the Gold Meal Mania video slot. You can stop the autoplay mode at any time by pressing the “Stop” button. Blonde Legend is a decent enough video slot, but is mostly only recommended for fans of Marilyn Monroe. If she was too far before your time and you have little interest in her, you probably wouldn’t be interested in playing Blonde Legend. It has some nice special features, but nothing that makes it stand out above any other video slots. You can play the Blonde Legend video slot at Bovada. Marilyn Monroe was a singer, actress and model. Marilyn became the most famous female star of the 1950s and 1960s before her tragic death in 1962. Are players from the USA able to play the Blonde Legend video slot for real money? Unfortunately, American players are unable to play Blonde Legend Slots for real money at this time. For a great number of USA-friendly slots you can play from within the States, please visit Bovada. Can I play a flash game of the Blonde Legend slot machine for free? Yes, you can play a free flash game of Blonde Legend at 888 Casino. You can play for free or real money. If you experience any difficulties with the flash casino, make sure you have the most recent version of Adobe Flash Player.